Click here to download and see enlarged photo. 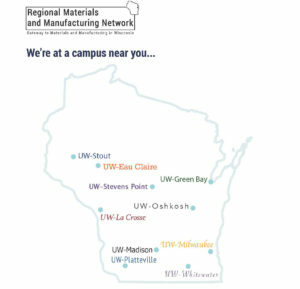 MRSEC faculty, through the Wisconsin Materials Institute (WMI), is establishing the Regional Materials and Manufacturing Network (RM2N) to connect the University of Wisconsin System’s resources in materials and manufacturing to benefit regional industry. The MRSEC and UWAMIC are providing best practices in student, faculty, and industry engagement for the RM2N. The network consists of nine UW campuses (UW-Eau Claire, UW-La Crosse, UW-Madison, UW-Milwaukee, UW-Oshkosh, UW-Platteville, UW-Stevens Point, UW-Stout, UW-Whitewater) with materials engineering programs and 27 industry affiliates. Its first initiative has been the creation of a web portal with a search engine for equipment and expertise on all nine campuses: http://wiscmat.org. Other initiatives include MRSEC-sponsored annual symposia that bring together over 100 of researchers in academia and industry and showcase student research, and special topics workshops. The first workshop focused on networking state-wide resources in education outreach (coordinated by the MRSEC’s Interdisciplinary Education Group), and understanding needs of industry. Industry needs identified were simplified and transparent IP negotiation, mechanism for industry-university team consulting, and easy access to equipment and data interpretation. The MRSEC is planning several initiatives to address these needs.